And after painting the autumn scene I decided to paint a little spring as well. 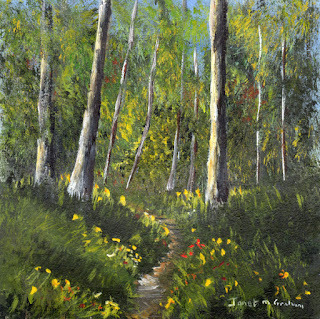 Spring Woods measures 5 x 5 inches and is painted on Colourfix Smooth paper. 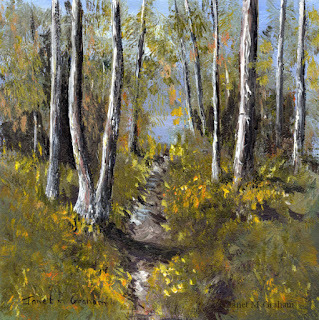 Autumn Days 2 measures 5 x 5 inches and is painted on Colourfix Smooth Paper. To bid in the Daily Paintworks auction, please click. 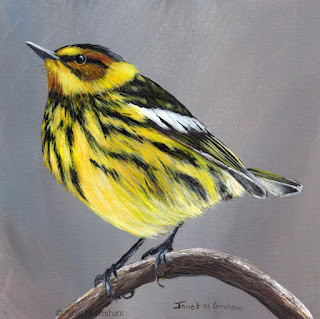 Cape May Warbler No 2 measures 5 x 5 inches and is painted on Colourfix Smooth Paper. I love how this one feathers are all fluffed up. 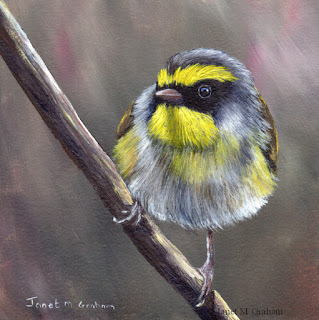 Southern Beardless Tyrannulet's are found in South America. They measure around 10.2 cm in length and weigh about 7.5 grams. Southern Beardless Tyrannulet measures 2.5 x 3.5 inches and is painted on Colourfix Smooth paper. 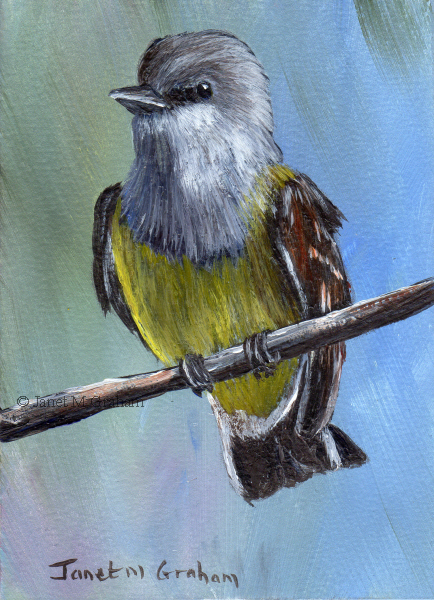 I really enjoyed painting this one and I love the contract between its white head and black/brown feathers. 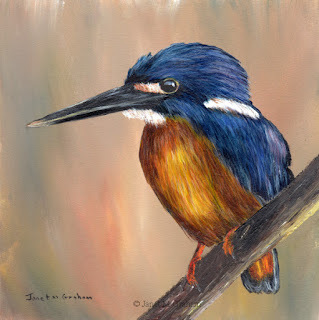 I did quite a few glazes to get the depth to its feathers. 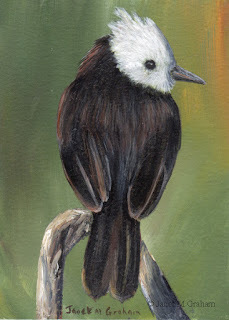 White Headed Marsh Tyrant's are found South America. They measure around 12.7 cm in length and weigh around 15 grams. White Headed Marsh Tyrant measures 2.5 x 3.5 inches and is painted on Colourfix Smooth paper. Azure Kingfisher measures 6 x 6 inches and is painted on Colourfix Smooth paper. 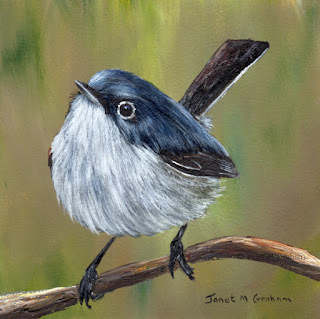 Blue Gray Gnatcatcher No 2 measures 5 x 5 inches and is painted on Colourfix Smooth paper. 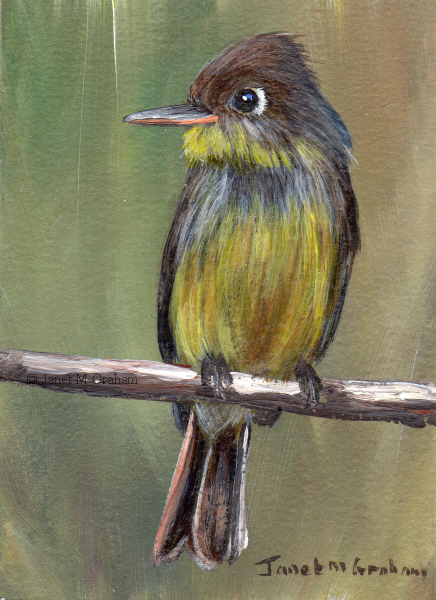 Royal Flycatchers are found from Southern Mexico through to South America. There are 4 species of Royal Flycatcher's and they range in length from 15 - 18 cm and weigh between 12.5 - 23.5 grams. 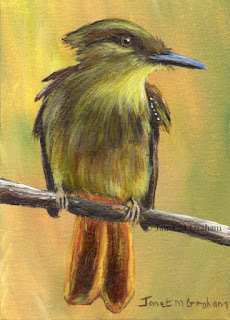 Royal Flycatcher measures 2.5 x 3.5 inches and is painted on Colourfix Smooth Paper. I love this ones feather colours and the tilt of its head. 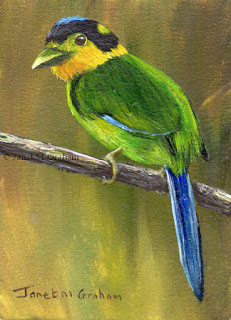 Long Tailed Broadbills are found in Himalayas through to North Eastern India and South East Asia. They measure around 25 cm in length and weigh between 50 - 60 grams. 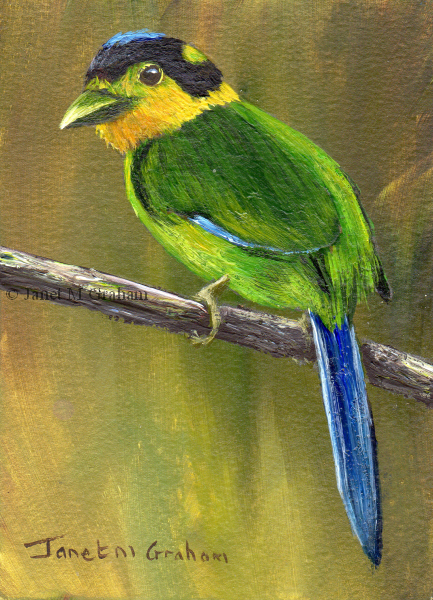 Long Tailed Broadbill measures 2.5 x 3.5 inches and is painted on Colourfix Smooth Paper. 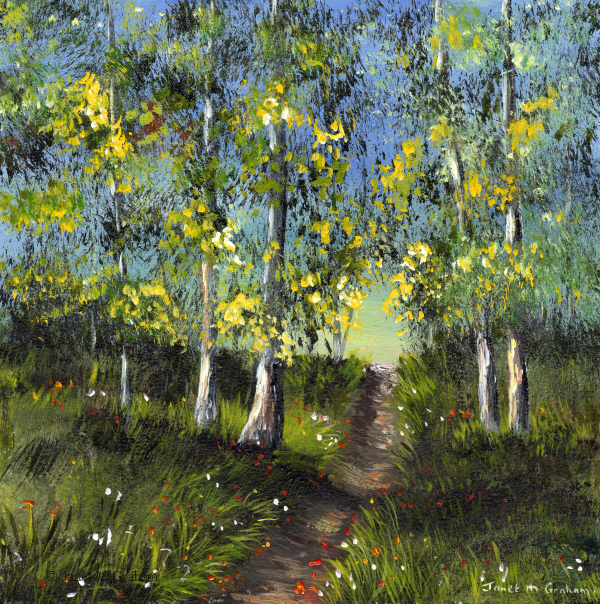 Enjoyed painting this one - I started off with just the basic placement for the trees and path and then built the painting up from there. Walk in the Woods measures 6 x 6 inches and is painted on Colourfix Smooth paper. Blackburnian Warbler No 2 measures 5 x 5 inches and is painted on Colourfix Smooth paper. This one was a little bit more tricky to paint than I thought it would be. 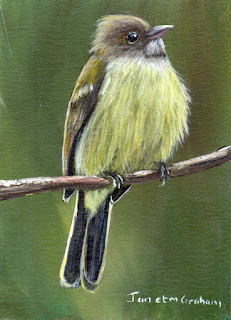 I had to do quite a few glazes to get the depth to the head feathers. Rather please with how it turned out in the end. Western Kingbirds are found in Western North America and Central America. They measure between 20 - 24 cm in length and weigh between 37 - 46 grams. 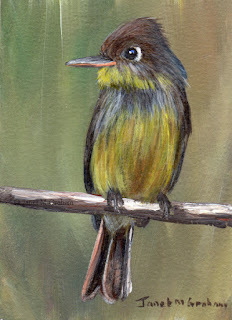 Cuban Pewees are also known as Crescent Eyed Pewees and are found in Cuba and Northern Bahamas. They measure around 16 cm in lengh. 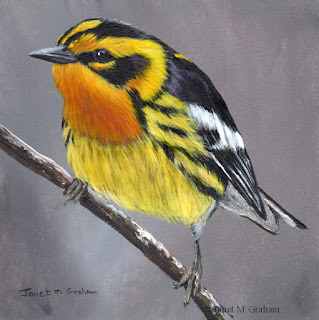 Black Faced Warblers are found in India, Bhutan, Myanmar, Nepal, China and Vietnam. They measure around 10 cm in length and weigh about 6 grams. Black Faced Warbler measures 5 x 5 inches and is painted on Colourfix Smooth paper. 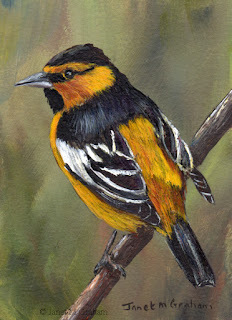 Bullock's Orioles are native to Western North America. They measure between 17 - 19 cm in length and weigh between 29 - 43 grams. Bullock's Oriole measures 2.5 x 3.5 inches and is painted on Colourfix Smooth paper. 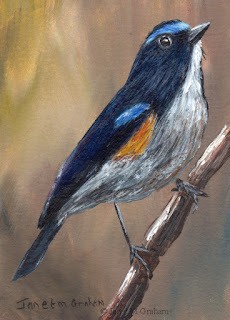 The Himalayan Bluetail (also known as Himalayan Red Flanked Bush Robin) breeds in the Himalaya's. They measure around 13 - 15 cm in length and weigh between 13 - 18 grams. Himalayan Bluetail measures 2.5 x 3.5 inches and is painted on Colourfix Smooth Paper. 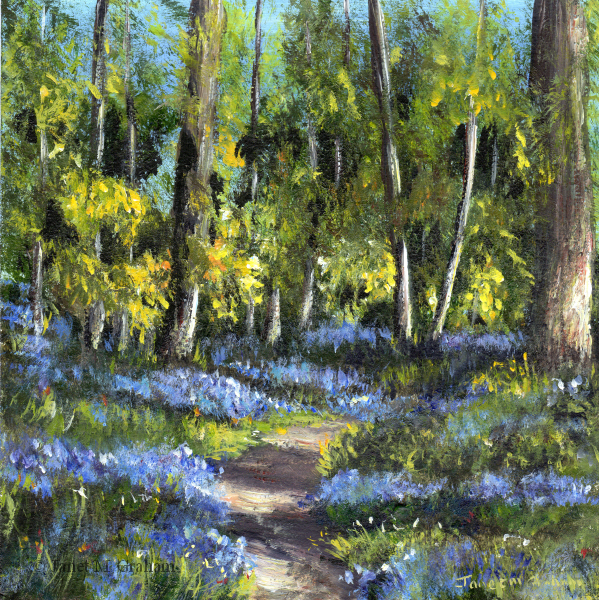 I love painting bluebells so couldn't resist painting this little scene. 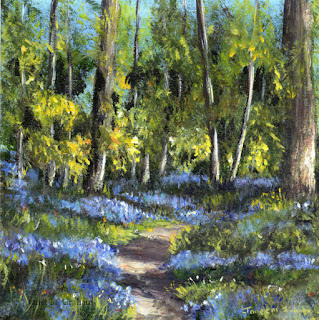 Bluebell Forest 2 measures 6 x 6 inches and is painted on Colourfix Smooth Paper.